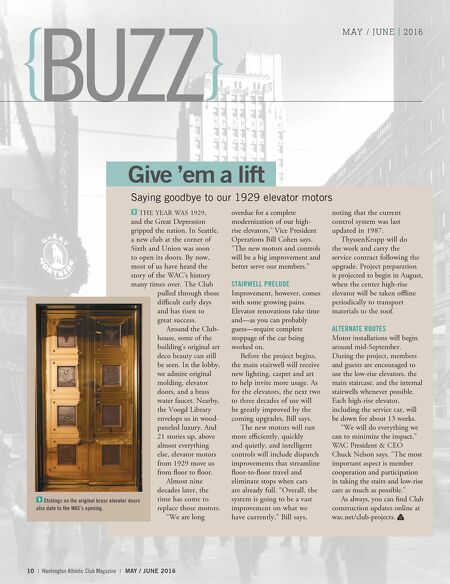 MAY / JUNE 2016 | Washington Athletic Club Magazine | 11 4200 River Road Louisville, KY 40207 502.896.0375 louisvilleboatclub.com CLUB DINING » The Courtroom, the club's premier dining facility » Crow's Nest member bar » Six banquet rooms serving up to 200 guests CLUB HAPPENINGS » May 6: Kentucky Oaks Brunch » May 7: Kentucky Derby Brunch » August 20–27: Louisville International Open IN LOUISVILLE » Kentucky Derby Museum: Fun for the whole family. Book your stable tour early. They sell out. » Belle of Louisville: The oldest operating steamboat in the U.S. » Mint Julep Tours: Offering tours of historic Louisville, horse country, and local bourbon distilleries. Reciprocal Club Louisville Boat Club—Louisville, Kentucky By Michelle Abbess, Member & Reciprocal Club Writer Southern charm on the river This classic club offers great hospitality, boating and tennis LOUISVILLE BOAT CLUB Michelle Abbess previously oversaw the WAC's reciprocal club program as Director Member Services. She continues to visit clubs in the WAC's reciprocal network as an active member. Contact WAC Member Services at membership@wac.net. For reciprocal letters of introduction or more information, call Member Services at 206.464.3068 or email membership@wac.net. J ust a few miles east of downtown Louisville, on the edge of the Ohio River, sits the Louisville Boat Club. Now the third- oldest boating club in the U.S., the Louisville Boat Club was founded in 1879 by a group of "rousing, river-minded men." Boating is truly at the heart of this club, which has slips that accommodate most river vessels. ‹e original clubhouse was a humble riverboat. ‹e current large brick clubhouse with colonial touches sits on 33 manicured acres. ‹ough the clubhouse has changed a lot over the years, the club still offers Southern charm in spades. ‹ere is something about the surroundings that makes you want to practice your best Southern accent, declaring, "Frankly, my dear, I don't give a damn!" And with stylish events, such as the annual Oaks and Derby brunches, you'll be able to don your best derby hat and do just that. Not to be outdone by the boating and beauty, the club's exercise facilities are notable, as well. ‹e six-lane outdoor pool is a popular spot in the summer. (‹e pool is open Memorial Day to Labor Day). ‹e club also hosts special pool parties, with dive-in movie nights and deejays after swim meets. But the most popular land- based sport at the club is tennis. Over the years, the club has hosted multiple Davis Cups on its 13 outdoor courts. ‹is year, the courts host the Louisville International Open, which will draw some of the world's top female players. 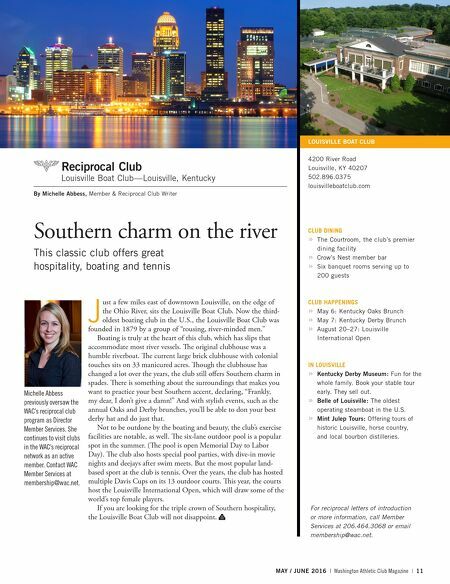 If you are looking for the triple crown of Southern hospitality, the Louisville Boat Club will not disappoint.